They say hindsight is 20/20 and that everything in life is a lesson if you let it. With that in mind, and assuming I don’t start kicking myself all over again, let me tell you a little tale of how I almost gave all my information over to a fake company, with a fake job, and nearly didn’t see it coming. There are a lot of jobs out there. There are also a lot of companies big enough to host those vacancies on their own websites for us to submit our information to, something I’m deeply familiar with. The only flaw (imho) is the fact your application gets lost in the nobody-to-contact-or-follow-up-with-so-all-you-can-do-is-wait black hole of helpless despair. But I digress. For those companies who are smaller, or who only have one or two vacancies needing filled, there are legitimate recruitment websites in which you can enter your job listing, then sit back and wait for the candidates to start sending you their information. That’s how I heard about this particular job, the fake one. From a legitimate job posting website. And neither I nor the company hosting the post had any clue it wasn’t real. So what happened? I saw the posting a few days ago on the [I’ll keep them unnamed since it wasn’t their fault] job site and read it through with interest. Some of the posts can be really detailed, and some offer the most basic information, leaving you to trust your gut on whether to submit your information or not. This one had a company name and a brief description on what they wanted. It seemed fine enough, no red flags, nothing to indicate anything untoward. In fact it was within a sea of other posts I’d applied to and it blended right in. However, they were interested in my application and so I got an email through the website that they wanted to interview me the next day. In my excitement I googled the company name, and found it was a real company, and looked through all the information I could find on their website and their Facebook page to see who they were and to familiarize myself with their business. For all intents and purposes, they passed the first test. In the email it said they wanted to do the interview over instant messenger and, having worked for a number of small companies in my life whose owners are tech shy, this never registered with me as a problem. That was the first red flag I missed. The scam: Scammers have started using fake instant messaging accounts created through programs like Yahoo! Messenger and Google Talk in order to conduct fake job interviews with unsuspecting job seekers. 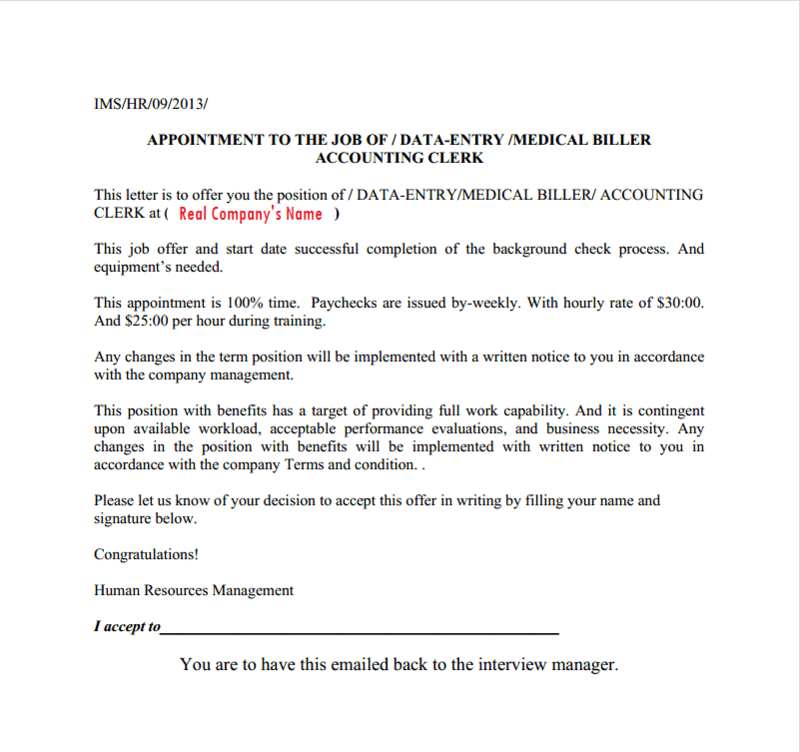 How to spot the scam: While instant messenger has become a great way for employees to communicate with one another, it’s very rare to find a legitimate company using IM to conduct job interviews. If a company asks you to chat with them over IM, request a phone interview instead, and make sure they give YOU a number to call, and not the other way around. Before consenting to any interview, research the company to see if you find any red flags about them. As you can see from this actual transcript of an IM chat between a scammer and a job seeker, the scammer’s English language skills are often lacking, they offer unnecessary details like their age, they use lots of !! and ?? punctuation, and they are able to provide the job seeker with a hiring decision immediately. They then ask for $369 for software programs, and require payment via Western Union, another huge red flag. I download yahoo messenger the night before the interview and find the person I’m supposed to interview with. There’s a profile photo (I know, I know…) and their email address in their bio. Nothing else. Then again, I’m not one for filling my own bio on messenger applications with lots of details so I’m hardly going to complain that someone else’s is lacking in information. The next day we start the interview over IM. It’s a first for me, but I’m happy to play along. She – the scammer posed as a woman – proceeds to tell me about the company, and the information looks not unlike a press release version of the information I’ve already seen on the website the night before. Then she tells me that the position is work-from-home and I completely miss this second red flag. What can I say, I like the idea of working from home and getting to hang out with my dogs all day. [scammer]:The supervisor, who will be connected to you online, will assign logs of duty daily and you will be required to follow instructions to the detail using Microsoft Office and a specialized accounting software. The function of the accounting software is to arrange, formalize, and manage the data you have processed which you will then send to your supervisor via e-mail. [scammer]: You will undergo a week training from your training supervisor. During that time, he will be training you to work with the company-specific programs with much accuracy and other data entry tasks you will need to get done. Your training will be conducted online through your PC or cell phone. Which do you prefer ? I tell her I prefer training over PC because I can’t fathom what on earth training would look like over the phone, and don’t consider myself patient enough to put up with someone talking in my ear as I try to navigate a new computer program. And therein lies the reason I missed the third red flag. The company would be mailing you a check which you will be using to purchase the needed software’s and mini office equipments. These software’s would have to be purchase from the company’s certified vendor’s. Also most of the equipments you will be getting from the vendor’s are tailor-made. which was meant for the company alone. understood ? When I told hubs – who I was messaging back and forth with on imessage at the time – this raised his suspicion. Why, after all, wouldn’t the company just purchase the software and office items from their own vendor and ship it to my address? I just thought she was kooky and put it down to me interviewing with a tech-phobic terrible speller of a woman who probably hadn’t even considered there were more effective methods to running a business. There’s a part of me that is also aware she has a job (yes, I know… sigh. Hindsight, remember?) and I don’t want to annoy her or lose the opportunity at getting gainful employment. Sad but true. Then it goes quiet for about ten minutes and I message my husband that she must have fallen asleep. Perhaps she’s interviewing a number of people on IM and can’t keep track of the windows. Perhaps she had to stop to take a call. Perhaps she’s looking me up on google and realizes I’m gullible and perfect for scamming. Who knows. I finally give in and message her to ask if she has any more questions. How much training do you think you need to become a productive employee? Though I find the first question insulting because I know what I wrote in my resume and what I put on the job site in my application, I answer politely. I mean, in my mind she’s a kook who can’t even remember she’s interviewing me. And I describe myself as kind, determined, and creative, because I am. what do you understand by privacy and code of conduct? This is when I start to wonder if the person I’m interviewing is a kook or just really strange. How exactly do you answer a question like that? I tell her I’m familiar with them, having worked in many businesses that are very specific on making sure their employees know the rules and standards expected of them. And, after a few more questions that seem very generic and typical of interviews, I’m starting to wonder what I’ve let myself in for. She asks my address and, like an idiot I give it to her because, in my defense, I’m still thinking there’s a real job being offered here and I don’t want to come across as rude and unreasonable, particularly since I looked at the website and really liked the company. After I press SEND, however, the gut feeling that I’ve been had takes over. I message my husband and we go back and forth over what she asked and we both come to the same conclusion. Nuts. I’ve been scammed. Now what do I do? I start digging for information to see who exactly this company/job person is. [me]: Do you have a company website? [me]: Am I correct in thinking you are based out of [real company’s location]? [me]: How many employees do you currently have? [scammer]: We’re currently working on it. so it’s down for now. While I’m googling the information and verifying that it’s bogus, I get the job. Well, the fake job. And for your amusement, below is the offer letter. As you can see it isn’t on company letterhead, nor does it have any contact information or anything particularly useful in it. And they want me to sign it and send it back. Which isn’t going to happen. I play along a little longer in an effort to get as much as I can, so ask for a contact number from her. Which she gives me. I should note that I didn’t call it because I had no idea what I’d find on the other end of the line and, having been scammed, I wasn’t in the mood to get in a shouting match or some other unpredictable confrontation with the person who’d strung me along about a job which wasn’t real all morning. The final nail in the coffin for the scammer was when I asked for the letter to be resent on company letterhead. And all I’ve had since then is radio silence. The saddest thing in all this, once the dust settles and I stop being furious at my self for falling for the scam, and the scammer for duping me, the saddest thing is that there was no job. I’ve been looking for months and, while I am an actor and am looking for an agent and auditions, I also want to be able to pay my bills. In a perfect world I would have an admin or executive assistant job with one of the networks or production companies, where I could live the rest of my days working in the entertainment industry, encouraging other actors and creative types, and being one of the little cogs in the big wheels that turn our behind-the-scenes work into the TV shows and movies we love so much. There was no job, and that really is the hardest thing to get my head around. This scammer went to a lot of trouble spoofing a company even to the point they had a similar website name as the legitimate one, and they took all the information from the real company and recreated it, not quite verbatim, during the interview and tried to convince me they were the real deal so that I would trust them with my time and my information. It’s sad and pathetic that there are people like that in the world. It’s equally sad that there are people like me who will be caught out by them and perhaps won’t be as fortunate as I was to realize it was a scam, and end up a victim of identity theft because of these people. The folks over at http://www2.idexpertscorp.com/ are great, and I spoke to them about this yesterday. They let me know that this kind of thing happens a lot and the scammers are becoming more sophisticated about their methods. So while I might still feel compelled to keep kicking myself over being duped, I should at least take comfort in the fact I’m not alone, and I did manage to figure it out before any harm was done. My pride may be dented, but my information and identity are still secure. So there you have it. I’m still mad I was duped but after writing all of this I can at least rest easy knowing that my experience here might save someone else from being scammed by a fake job posting. Stay safe and remember, it can happen to the best of us. I had just this exact same experience. I also was “duped” into giving him my name and mailing address as well as my phone number. I did in fact verisign the offer letter and he says he will need to speak with me tomorrow at 9am. I’m going to call the company that he says he represents and let them know this is happening and go through with the follow-up conversation as well with the seemingly “advanced” scammer. My question to you – what did they scam me out of? I never gave him any data about my banking information other than the name of the bank I use which, they won’t give him any info about me unless he can verify he/she IS me. Why are they wasting two hours in a Google Hangout to chat with me? Are they trying to send me a fake check which would be caught by my financial institution and NOT cashed anyway? I am very confused what the scam is here other than now knowing my name, address, phone number and my verified active email address. All things easily obtained on my resume if I had simply responded to a fake job post. Thanks for posting this! It’s diving me mad trying to figure out what they gained by spending all of this time trying to dupe me. I’m pretty sure the rest of the scam will be known to me tomorrow when I speak to this guy again and of course I’m fuming mad that I bothered spending this many hours on it. What international medical company text interviews candidates and hires them on a Sunday night with no verification of references lol. Hi Maureen. What a shame that you’ve experienced this too. I think that the goal of scams like this – and googling it seems to agree – is to gather as much information about a person as humanly possible in order to steal your identity. It could also be that, further along the ‘hiring’ process we would be filling in direct deposit slips and thus exposing our banking information to the fake company. Just think of how much information you give to HR when you’re accepting a job offer. Everything from references to work history to education to salary expectations. All of this would be exploited by a scammer, especially if any of this pertains to your secret questions for banks or other valuable locations. DO verify before you trust! Taking the time to run through the steps above will not only save you the time and energy it takes to apply for a job, which is time wasted in this case, but it can also save your bank account, identity, credit rating, and much more that you value highly. Yes, it’s a tough job market, and being unemployed is very unpleasant. But being scammed at the same time you are struggling with a job search is additional stress no one needs. I’m glad you saw that the job posting you were applying for was fake before nothing more than pride (trust me, I know) was hurt. Here’s hoping that the next one is real, great, and perfect for you. « Monsanto Has Been Removed And Banned By: Austria, Bulgaria, Germany, Greece, Hungary, Ireland, Japan, Luxembourg, Madeira, New Zealand, Peru, South Australia, Russia, France, and Switzerland!